The Falcon 50 may be arguably one of the most famous business jets ever to fly, but it's namesake is no less impressive a flying machine. My friend Dave House enjoys flying his falcon most weekends and might spend in a lifetime, the equivalent of an hours worth of fuel of the former, while enjoying his sport. Dave's birds are trained to hunt (typically rabbits) and in conjunction with special hunting dogs which he uses to ferret the rabbits out of their hideouts, he and his son (and wife too) enjoy the fun to be had watching cute little bunny rabbits go up against his tag team killing-machine hunters in a match with outcomes weighted not unlike Bambi versus Godzilla. (Bambi doesn't stand a chance). Of course, pilots know that air supremacy is always the trump card. Booger (I didn't name him) enjoys a little downtime Falcon 50 below. Both nice birds. So, I've been corrected in my comparison with Dave's bird as a "Falcon" to the Falcon 50 business jet. Dave's bird is actually a hawk, which is a specific species of bird distinct from the Falcon. 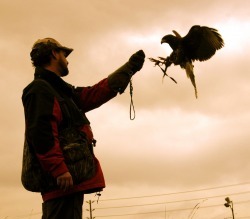 The sport Dave enjoys with his Hawk however, is called Falconry. 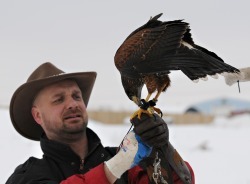 If you want to get really picky, Dave is technically an Austringer (person who flys hawks rather than falcons) but the terms have been used so loosely that over time the use of the term falconry has come to apply to anyone who flys a bird of prey. I still think the Falcon 50 looks "hawkish"